The (COSHH), Control of Substances Hazardous to Health Regulations 2002 are designed to protect people against risks to their health arising from exposure to hazardous substances during their working activities. These regulations also detail what an employer must do in order to keep his staff safe. Assess the risk to health arising from exposure to hazardous substances at work and identify appropriate precautions. Introduce appropriate measures to prevent or control the risks. Ensure that control measures are used, equipment is properly maintained and procedures are followed. Where necessary, monitor the exposure of workers and carry out health surveillance. Inform and train employees with regard to the risks and the precautions to be taken. Singleton Training Services Ltd will undertake COSHH audits and risk assessments. 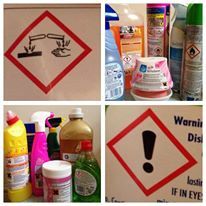 We will set up your COSHH systems including assessing chemicals, organising COSHH data sheets and suggesting control measures to protect your workforce from exposure to chemicals in line with the legislation. We also offer a short course in basic COSHH training. Means of entry of chemicals into the body. Effect of chemicals on the body. Definition of Haz-chem symbols and new CLP symbols. Brief overview of current exposure limits. We can run courses in house or at our purpose built training centres in Lincoln and Grimsby. We also run open courses regularly for individuals or business needing to train single employees. Click here to download COSHH syllabus.